It’s hard for me to pick favorites from either of the two Word Fountain issues that I’ve had a part in bringing to life. But here is one that got me excited back when we first received the submission. I love when a poet takes something old, twists it around, and makes me look at from a new angle, makes me question the old adages and aphorisms and what we accept as truth. There are a lot of marvelous poems by Ronald Wallace–“Oranges” is one of my all-time favorites–but I think this spin on a Wallace poem just might rival the original (Shhh, don’t tell RW I said that). The poem is entitled “Time” after “Blessings” by Ronald Wallace. It’s written by Lara Dolphin and printed both online and in the hard copy of Word Fountain’s 2017 winter edition. Head over to our Submissions page if you have short fiction or poems to send to us for the spring-summer issue. 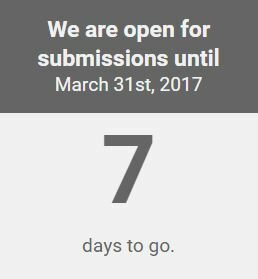 There are only 7 more days to the deadline on March 31st! Thank you for introducing me to this poet! Yes, I love “oranges” too. Also the next one about “the facts of life” and telling a child how babies are made was delightful, and so true. Best not to push a child beyond their ability and willingness to understand such stark facts. The magic of life-giving–storks, fairies, God–probably speaks to the deeper meaning of child-making and creation anyway. Yes, I liked that one a lot also. Thanks for such wonderful comments, Deborah!